with school starting up again in just a few more weeks (please don’t go, summer!!!) i’ve been starting to think about getting back into a routine/schedule/state of organization. aside from the normal “back to school” schedule we also have to add in all the extra-curricular activities, sports, homework, and everything else that comes along with the start of fall. those things alone are enough to make mom busy. and tired. but then add in the meals and shopping, and all the other stuff moms do on a regular basis and it’s enough to want to stay in bed with a pint of ice cream. so i’m trying to implement a few ideas to save me time during the busy weeks ahead. i think that being prepared and organized ahead of time and working while the sun still shines will get me to a place where i can relax a bit and enjoy the hustle and bustle of the upcoming months knowing that at least our meals are taken care of and/or planned and will not take a lot of time to put together, which will, in turn, make me less stressed. a couple years ago when i was expecting, i knew that after our baby came i would not likely be getting to the store often so i made this free printable “busy day menu planner” to help me stock my pantry, freezer, and fridge so that i would have food on hand to make meals with. 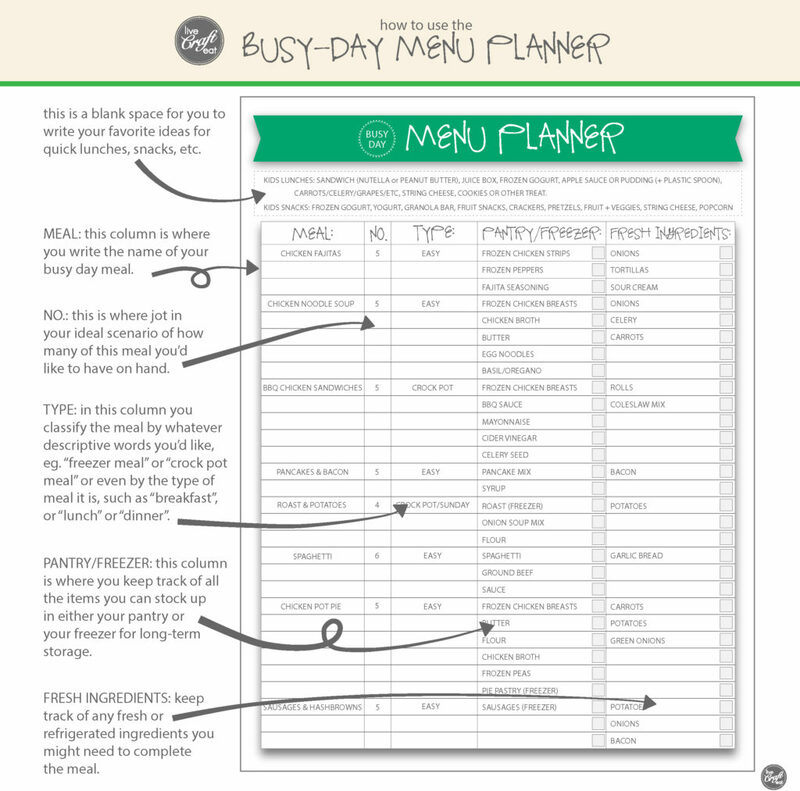 get your free printable “busy day menu planner” and see how i use it by clicking on the link. in addition to having a well-stocked pantry, i plan on making freezer meals, crock pot meals, one-pot meals, and meal “kits”. they are all quick and easy, and can sometimes be fully assembled, or at least prepped, ahead of time. this week i made some of my mom’s lasagna. 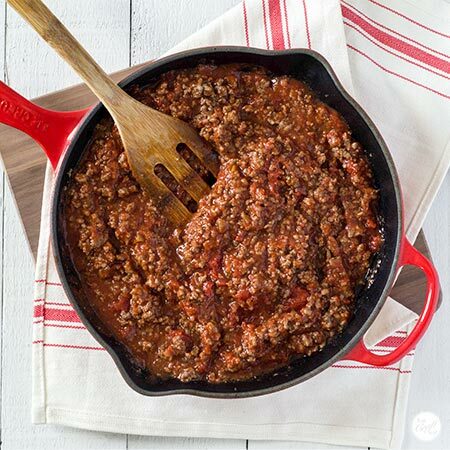 this recipe is easy enough to put together on a busy night all on it’s own, but if you double the recipe and save one to freeze for another day, then you’re guaranteed to have a delicious, healthy, filling meal ready for you when you need it. 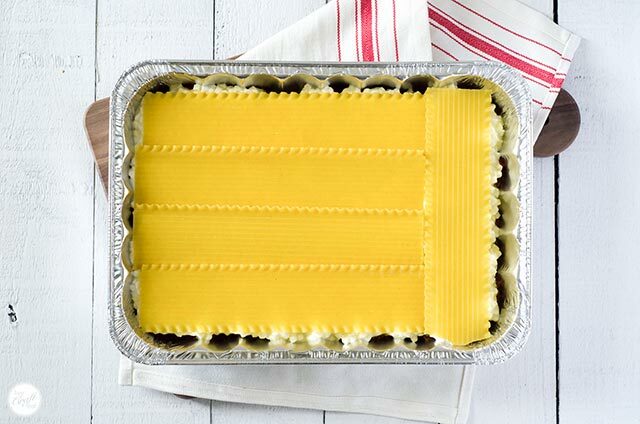 i remember my mom making this lasagna on sundays – with 8 kids she always made double just for that day! she would serve it with a salad, veggies, and rolls. it was my sister’s favorite meal and she asked for it every single year for her birthday dinner. it uses jarred marinara/spaghetti/pasta sauce. just use your favorite brand! it’s easy to crack open a jar and enjoy the flavor already incorporated into the sauce. plus, you can keep several jars in your pantry to use when you need them for other meals. no-boil lasagna noodles. my mom always used these. they might also be called “oven-ready” on the package at your grocery store. this means that you don’t have to boil water and cook the noodles ahead of time. 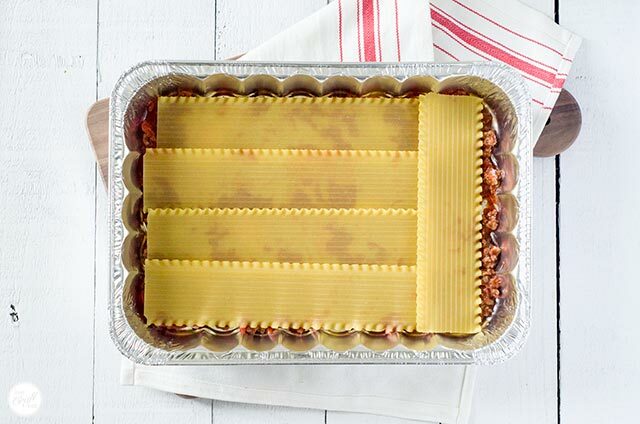 you can just take them right out of the box and use them as is in your lasagna layers. 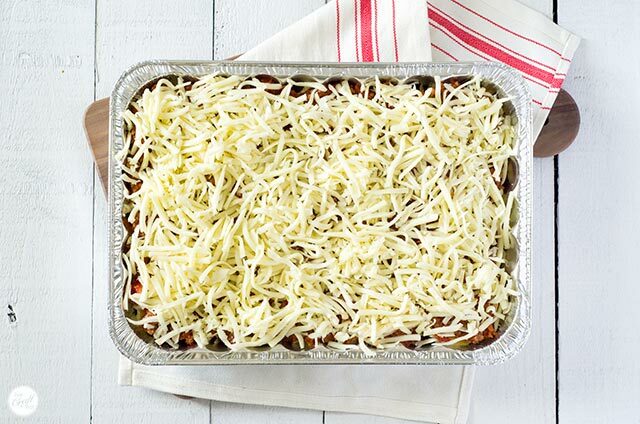 the moisture from the sauce and cheeses will help cook these in the oven while the lasagna heats up. but if you can’t find them, you can always boil your noodles and layer them in. 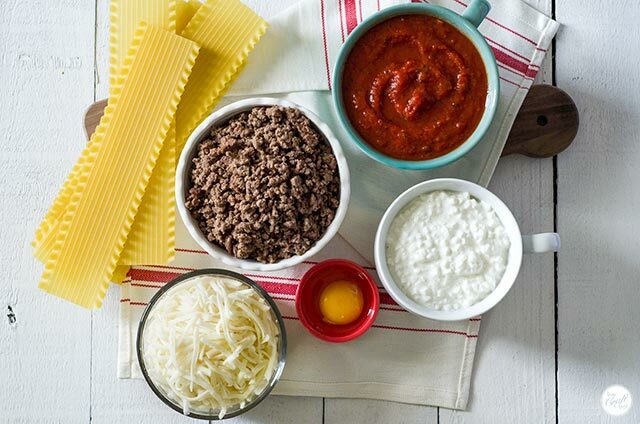 there are only 6 ingredients, and none of them are complicated :: lasagna noodles, marinara sauce, ground beef, cottage cheese, egg, and mozzarella cheese. it is so simple to put together. if you’re using the oven-ready noodles, then you’re really only using one pan to do any cooking. 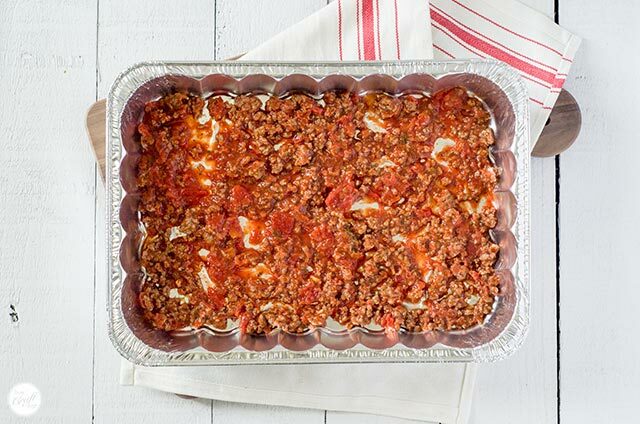 if you plan on freezing it, the lasagna itself can go in either an aluminum pan, or this freezer to oven baking dish (aff link) – it’s made from borosilicate glass which won’t break if you end up taking the lasagna straight from the freezer to a preheated oven. …and crack open the marinara sauce, pour it into the pan, and stir to combine. it really can’t get easier than that. and now we’re already into the layering stage! just. like. that. 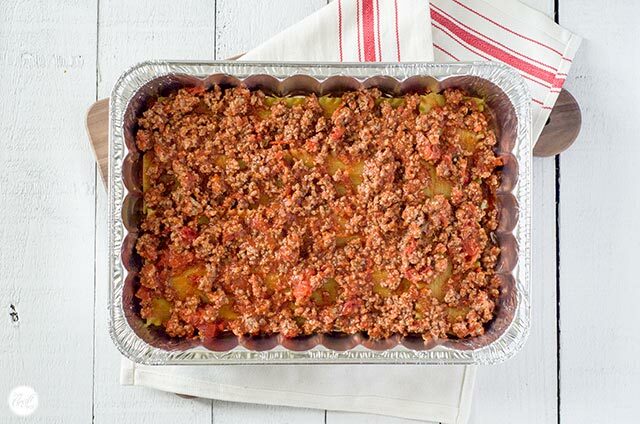 in the bottom of your baking dish, spread about 1 cup of the meat mixture. 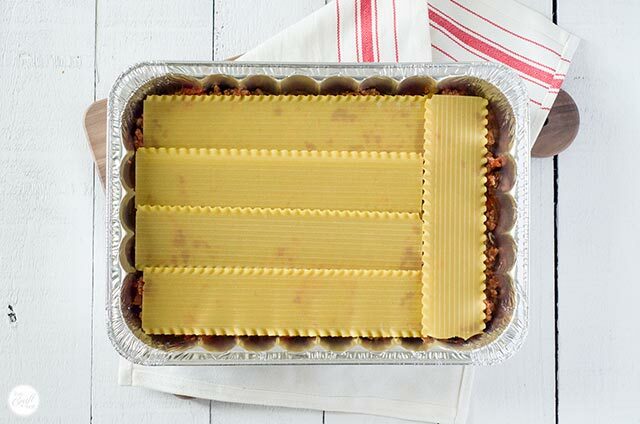 this gives the lasagna noodles something to hold on to and cook in. and pour half of the remaining meat sauce and spread it to cover the noodles. and in a bowl, combine the cottage cheese and the egg until the egg is fully incorporated. the egg just helps bind everything together. also, if you’re not a fan of cottage cheese (i love the stuff), you won’t be able to tell that it’s cottage cheese once it’s all baked, but you can always use ricotta instead. whatever cheese you decide to use, once you’ve incorporated the egg, spread the cheese and egg mixture as your next layer. 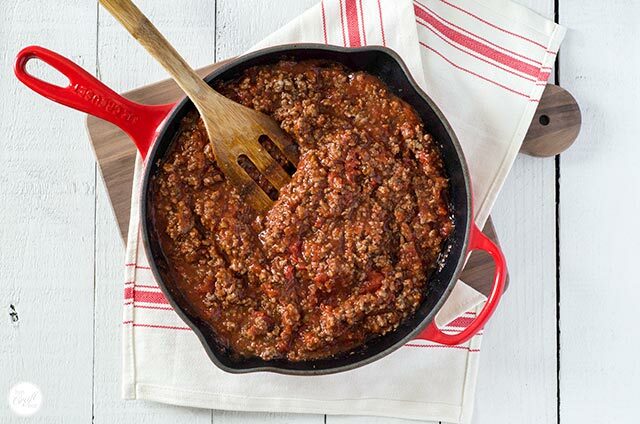 …and the remaining meat sauce. now all you have to do it grate some mozzarella and sprinkle it on top. you could also sprinkle on some parmesan cheese if you have some. yum! if you’re baking it right away, place it in a preheated oven @350 for 40-45 minutes or until the cheese is nice and golden and bubbly. my mom always let it rest for a few minutes after baking, and this allowed her to cut it into perfect squares without everything falling apart. 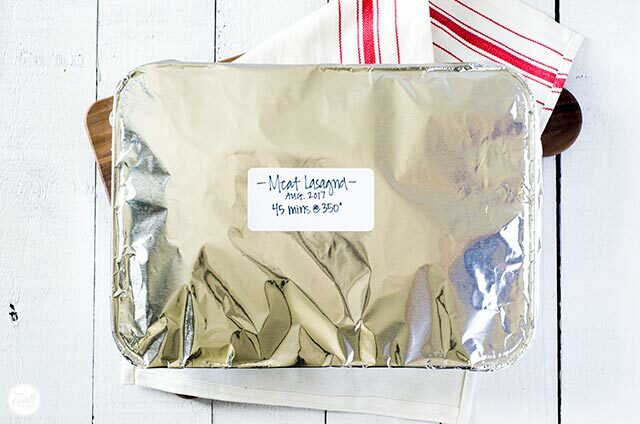 if you’re going to freeze the lasagna, place some heavy duty aluminum foil over top with a label and place it in the freezer. i have some free printable freezer labels if you’d like to make it all pretty like. pull the lasagna out of the freezer the night before you plan to eat it and put it in the fridge so it can thaw, and bake as per the regular instructions. forgot to pull it out of the freezer? needed a freezer dinner unexpectedly? 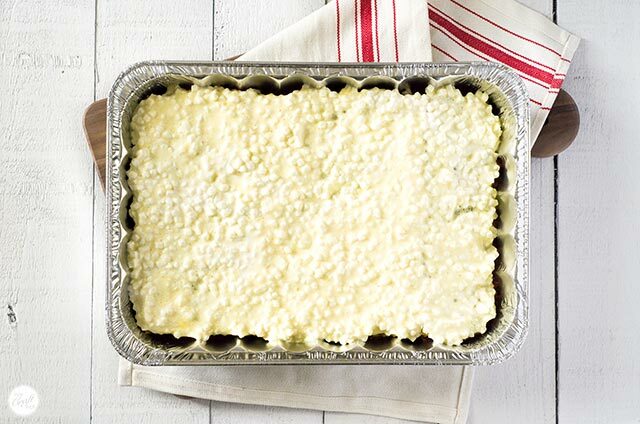 my rule of thumb for baking frozen dishes straight out of the freezer is to bake it for twice as long as it calls for when it’s thawed. this typically allows the first half of cooking time to defrost it in the oven, and then the second half to really bake it and heat it up. 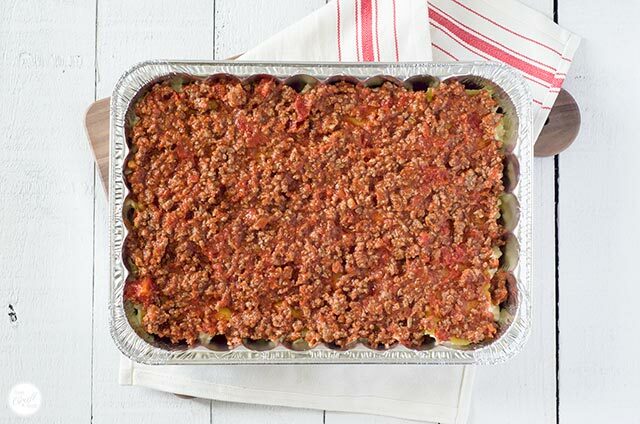 no matter how you look at it, this meat lasagna is perfect for either a busy night, or as a freezer meal. so it’s a win-win. plus it’s really tasty, so it’s actually a win-win-win. 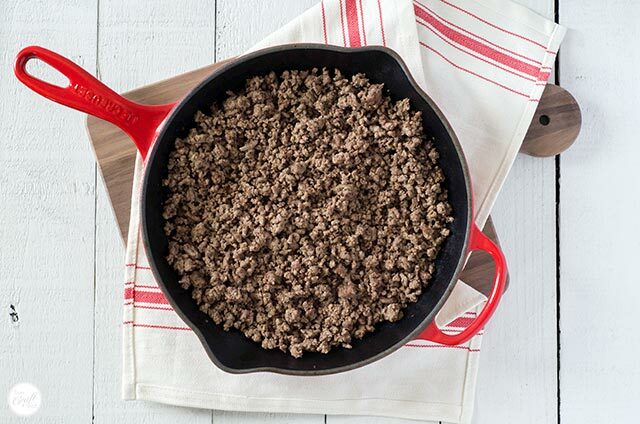 in a large skillet, brown the ground beef. add marinara sauce and stir to combine. set aside. combine the cottage cheese and egg and stir to incorporate the egg. set aside. bake in a 350 degree oven for 40-45 minutes, or until cheese is golden and bubbly. let rest for 5-10 minutes for perfectly cut squares. prepare as directed, but do not bake. cover with foil and place it in the freezer. if the lasagna is frozen, turn up the heat to 375 degrees and bake for 1.5 hours, or until heated through. Looks better when you make it! It is nice, eh?